Children sometimes just need some help developing their social skills. Our recreational therapists at Connections Therapy Center use a variety of interventions and techniques when working with a child with disabilities. A great example of such would be social skills development. It is essential for children to develop social skills at a young age because it will help them with many different aspects of life. The best way for a child to become a better communicator is through practice! Although your child may meet with a recreational therapist on a regular basis, it is important to realize that the learning doesn’t stop when they are at home! Children feel most comfortable with their parents, and that is whom they are going to trust most. If your child is struggling to communicate with others, make an effort to have ongoing conversations with them. Make sure to emphasize excellent social and communication skills when speaking with them. Be sure to stay attentive and show interest because that will also demonstrate good listening skills. In many cases, children with disabilities have difficulty expressing emotions, as well as understanding emotions from others. In order for a child to build relationships with others, they need to be able to comprehend different emotions. This is essential when it comes to any form of social interaction. As a parent, you want your child to receive as much repetition and practice with this as possible! 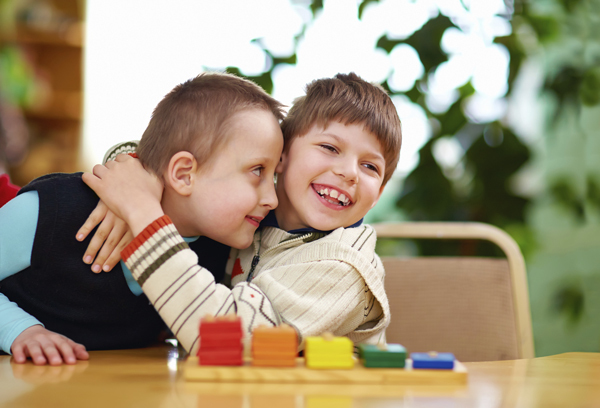 There are all sorts of games our therapists use when working with children with disabilities. An example of such would be charades! Sometimes, children just need to be given a chance to expand their current skill set. This may require a little reinforcement from their parents. Make an effort to get your child to interact with other children their age. This can be done by scheduling playdates or signing them up for a sport or activity. However, you don’t want to stop there! Make sure they are also learning how to speak to people of all ages. This entry was posted on Friday, October 20th, 2017	at 2:58 pm	. You can follow any responses to this entry through the RSS 2.0 feed. Both comments and pings are currently closed.